My mentor Mr Hu Li Yang, is interviewed by Sharesinvestment recently. An article is written on the interview. "He advises investors who are determined to invest, that stock markets are known to suffer from panics at least twice a year. During such panics, people will dump stocks and these stocks can drop to a level that is below its fundamental valuations. During such a time, investors should act and pick up such stocks at a bargain price. Towards the end of our short interview, Hu advised me to make it clear to readers that now is not the time to speculate and gamble. Greed is not something that is good to have at this juncture." US Stock Tip: Will Apple make a good comeback with this product hope? Apple lacks a product release and today there are some news about speculation on whether Apple will release a 5 inch i-phone. Well, that piece of news is enough to push Apple $15 ahead! This is the power of a new product release. Did you remember we talk about to BUY BIG if Apple does release a I-TV this year. Of course, if this happen, dont hesitate! Just go in with a bang on Apple. Having said that, if Apple did have a 5 inch i-phone new product, expect the stock to also continue its climb. We did said that $5 is a delicious price for semb corp, and encourage investors to take a look at this stock. We also mentioned that $4.70 - $4.80 is an accumulation phase. Recently it dropped to $4.90 lowest, and rebounded. Now it is at $5.13 on friday closing. I believed it has a momentum building. However we also feel that price will be going to be a bit tricky at $5.20-$5.30 range. It might take a rest. Let us in the meantime celebrate STI victory of advancing past 3330. And thank semb corp of a little contribution. STI after consolidating so long between 3240 and 3330, seems poised to break the 3330 curse, powered by a run in Genting and the 3 financial banks. After an Upgrade To Buy From Neutral By Bank of America-Merrill Lynch, Genting goes up 6 cts today. These 2 days, Genting has gone up near to 10 cts. 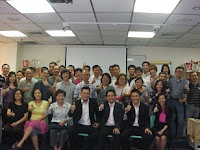 Tat Hong today also leap forward 6 cts. I am wondering will this run in mid priced stock trigger a run in some other mid priced stocks too? I will monitor closely. Stocks that are in mind are stocks like Yoma, Ezion. Sometimes stocks travel in flocks. A surge in confidence in some stocks can create an avalanche and spill over to similar priced stocks. Having said that, I am also placing my sight on the US market. Currently there has not been a sure signal that Dow Jones is about to go into a mid term bear run. S&P500 1540 strong support is holding well. But do take note should it break 1540, we need to be careful. According to Goldman Sachs latest report on the market, the "SELL in MAY and GO Away" effect may not happen this year. My view is that there will be a correction coming soon, but the big question is WHEN? My advice is if mid price stocks has a run, short term play is preferred to long term investment. We retailers always like something that falls in price by HALF just 6 months back. And you know what? One of the world's top 3 largest market capitalization companies, with the most cash reserve companies in the world, Apple, happens to be one of the them. Such an unfairness to the world of stocks? Why on earth does Apple deserve such fate? A fall in price by half 6 months back is UNIMAGINABLE! I am sure no analysts on earth would have predicted this outcome. $697.80 in September, $385 is lowest reached yesterday! Welcome to the real world of stocks, where fundamentals may not count much. Even one of the greatest hedge fund managers, David Einhorn is hopelessly wrong this time. But he got money to hold through this. earnings expectations, forecasts and estimates surprise. This is Apple's past few quarters earnings results and surprise. In the last 3 quarters, it has 2 of them in negative surprise territory, with the 4th quarter beating the expectations by only a miserable 2%. That is a complete failure to this company given its tremendous performance in past 4th quarters. Where have all the christmas rally gone? The previous year, it beats by 30%, but not last year. But the good thing is stock market can be extremely forgetful and forgiving too. One quarter is enough to forgive Apple for its sluggishness in execution. Hope it happens 2moro evening when Apple issues its first quarter results. This stock deserves a chance. 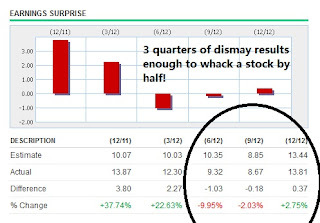 A good quarter is all it takes to get the fund managers to buy it up again, will it outperform Google this quarter? 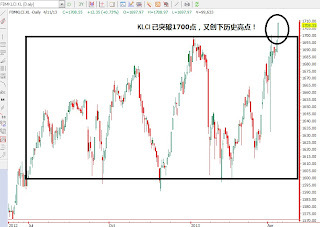 My strategy is to buy buy BIG into this stock when I-TV is expected to be released, hopefully by this year. $700 isn't a problem should it happen. I am just worried that Tim Cooks don't know hoe to rush for a new product like what Steve Jobs always does. How you can secure your ideal retirement with a lifetime of guaranteed income? How to safeguard your retirement income against inflation? A reading below 30 means Oversold condition. Entering position below 30 indicates Market Risk is low. Consider entering when Bearish signal turns Bullish. Nasdaq has been the most pressured index among all in american market. Today it dropped 1.7% while S&P500 dropped 1.37% and Dow dropped 0.89% at mid noon now. Do you remember that a few days back, we did mention that tech sector in our market sentiment indicator has turned bearish. This is because the tech stocks has generally turned bearish. You can see it reflecting in the Nasdaq index now as most are tech stocks. Apple, a tech stock, has also touched and broke $400 briefly. 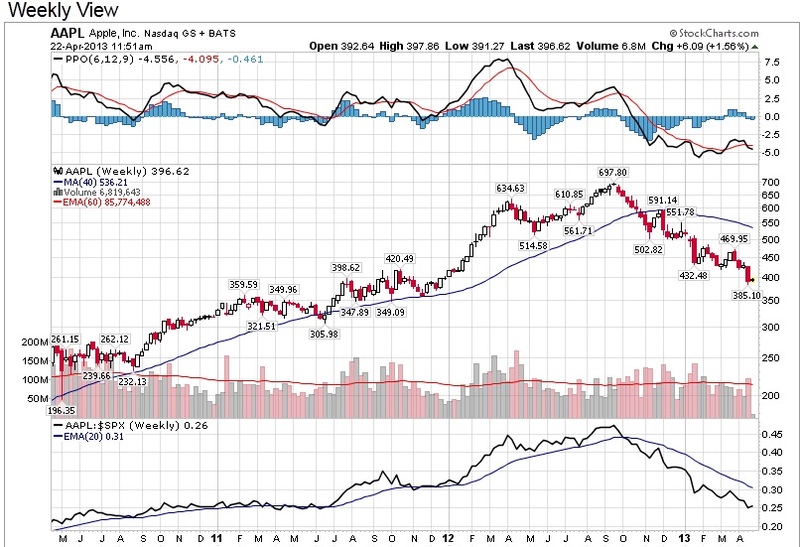 With more earnings coming from tech stocks, I am really taking a close look at what are the tech stocks that fall below expectations and these are the potential shorting targets! 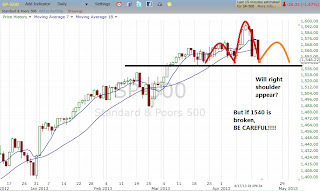 S&P500 neckline support at 1540, will it break if right shoulder is formed? 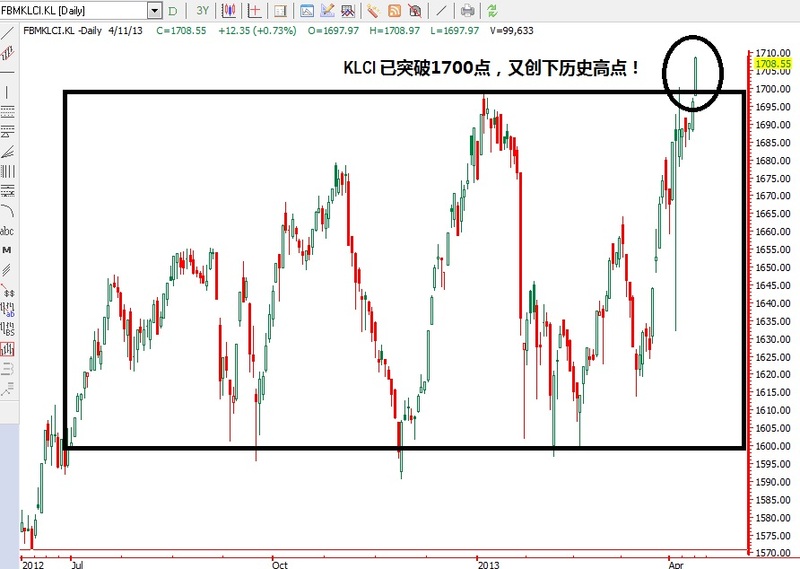 Today I did comment on what FM958 mediacorp DJ Di Cong ask, about the chart of S&P500. It indeed show a strong support at 1540. If indeed it rebounds off 1540, a head and shoulder formation seems to be showing. If a right shoulder is shown, and the neckline is broken at 1540, we need to be very careful! 1540 is point to watch out for. 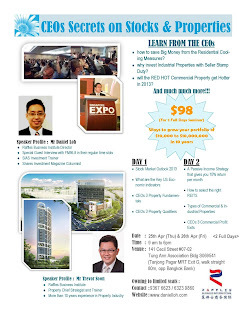 We are launching our 2nd CEOs Secrets on Property & Stocks Course! 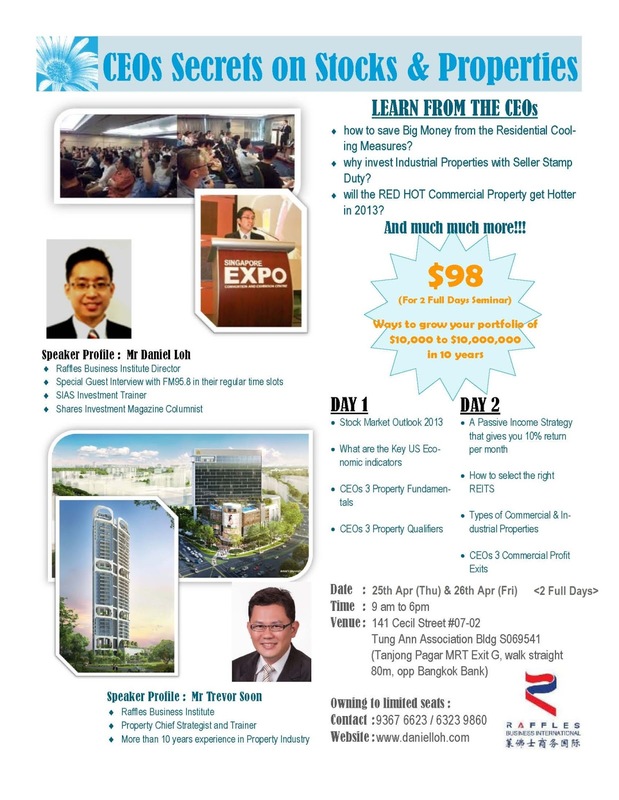 We are inviting All who are interested in stocks & properties, whether residential or commercial to participate in this seminar. 1) How do you protect yourself from the recent cooling measures in residential property if you are an owner? 2) How do you seek a good commercial property which is virtually free from any cooling measures now and is RED HOT now? 4) What is industrial property and why are the CEOs still looking to invest in them? 7) How are you going to build a portfolio of properties in 5 years and RETIRE Financially FREE? Our first seminar is a sold out success! LIMITED SEATS!! SIGN UP NOW!! or SMS <Name><Email><HP><Date><No of Seats> to 93676623 and we will contact you. Any inquiries, pls contact 6534 9979 to ask. Please Click on brochure, right click and save the image to see the brochure. Yesterday Dow dropped 265 points, S&P 36 points and Nasdaq 78 points. I believe that this drop is not the end. Our market sentiment indicator shows that that the whole New York Stock Exchange stocks about to turn bearish. As a friendly advice, we urge all short term players to liquidate short term positions. This might save you thousands of dollars. No matter how high this bullish run continues, we believe the risk is high. Goldman Sachs probably bring Gold to its knees these 2 days. A catastrophy indeed. Goldman last friday issued a shorting call. It is reported on Reuters that this is the worst 2 days drop in Gold in 30 years... 30 years!!! One friend told me that he believes some great and well known bunch of traders together shorted it. And Goldman Sachs certainly has a good hand on this. Great point. Certainly George Soros and Jim Roger has warned us 2 months before. This is the cruel financial world. Money changes hand from the retailers to the super wealthy. But as a retail trader, I would like to encourage all those traders that suffer from this incident to pick themselves up and not give up learning the art of investment. Bear market will come again when the whole stock market collapse one more time. It always happen and we may not need to wait 30 years for it to come. This is one good lesson learnt so that we wont be losing hundreds of thousands or millions in a stock market crash. It happened to my father in September 1998 when the clob shares incident occurs. At that time, it really affected my family deeply. Hope such an incident won't happen again. Is this the start of the stock market slide??? Singapore Penny Stock Tip: Did you forget HongFok? Using our ART system, the blue arrow indicates bullish behavior. P.S. 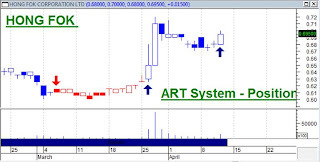 : if you want to know which singapore stock got indicative signals, do join our FREE Singapore stock seminar every Thursday and Friday. Join us to know what Singapore stocks to watch out for!!! 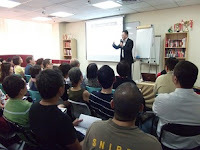 On 11 Apr 2013, Thu (English Seminar) or 12 Apr 2013, Fri (华语讲座Chinese Seminar). 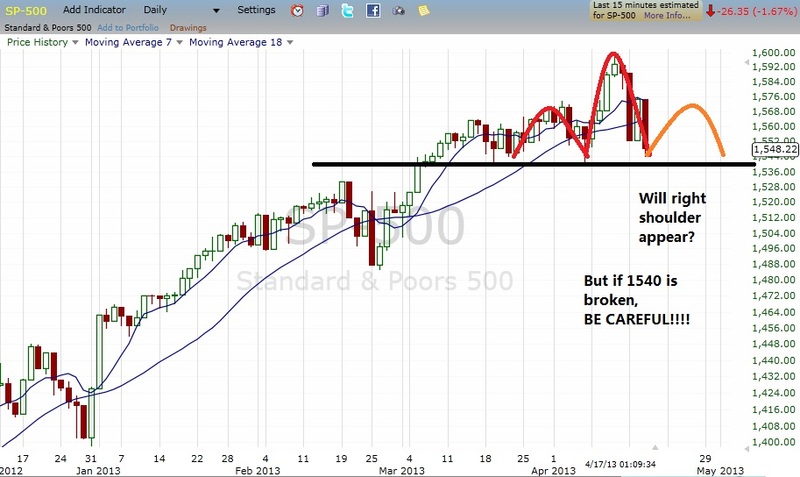 Plus we will be providing analysis on your stocks! 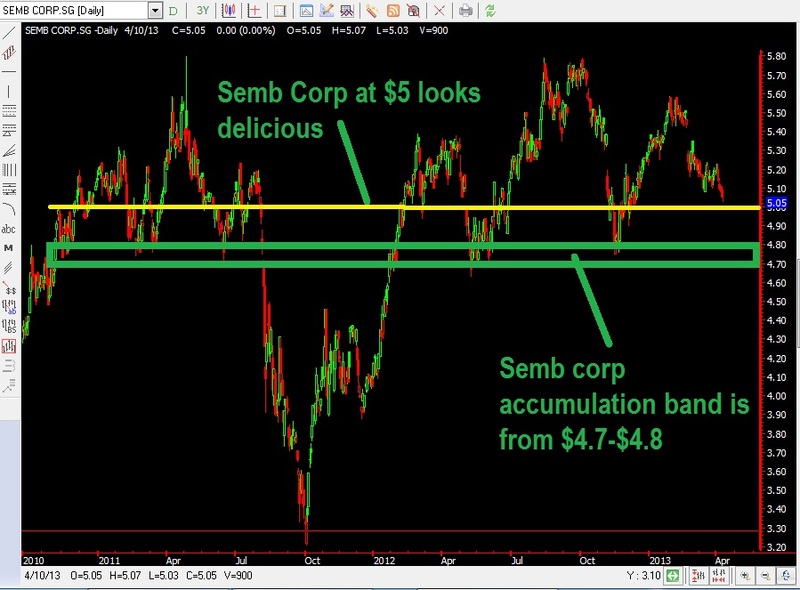 Singapore Stock Tip: Semb Corp accumulation zone is $4.7- $4.8, but $5 looks a bit DELICIOUS! Professional money know what is cheap. When we play mid to long term, we need to understand that there often is a accumulation zone where big players come in to scoop up the stock. 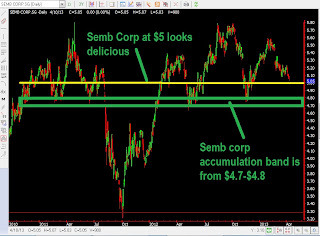 Reading from the charts, semb corp has a strong accumulation zone from $4.70-$4.80. The next time, when this company falls within the zone, you may want to accumulate with them. Having said that, there is also a support at $5. Now it is at $5.05. My suggestion is to watch carefully at $5. For this stock, I am prepared to play long term to hold through any correction, meaning I am prepared to park my money there for quite a while. My strategy is for long term play, I might buy a bit at $5 if it stands above $5 after touching it. But if it touch $4.7-$4.8, I would accumulate some more. Of course, if you have the patience to wait for $4.7-$4.8, that will be the best price to enter. For long term play, I am always prepared to plan to average down even before I buy. US technological sector, one of the most important sectors in US has turned bearish last Friday 5th April on our market sentiment indicator. This serves as a cautionary signal for us who are still very bullish about the market. 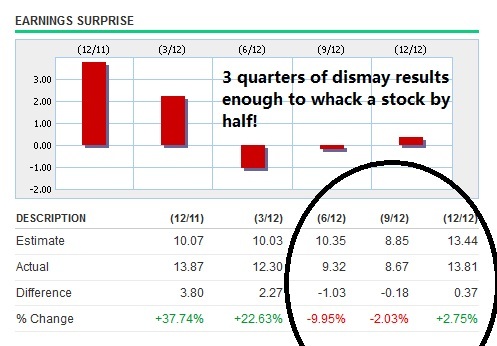 We shall see whether the US tech stocks this quarter declare better than expected results. Yesterday Alcoa did quite well beating earnings estimates. Do take note that tech sector tends to slowdown in their earnings following the powerful 4th quarter results in January. For me now, I would prefer to be on the sidelines waiting for the consolidation to arrive. 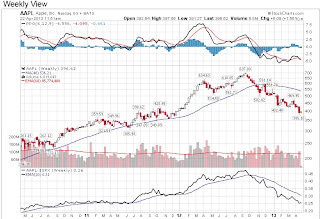 May consider shorting the US tech sector ETF, or short some tech stocks. 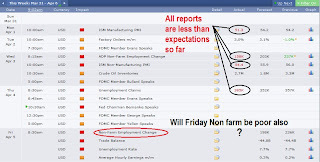 It has been a "So far so bad" situation on the economical reports. Everything from the ISM manufacturing data, ISM non-manufacturing data, ADP employment to the weekly jobless claims have been worse than expectations. However what is good about the market sentiment is that it remains to be a "So far so good" situation. With yesterday's poor jobless claims, the DOW actually still managed to close 56 points higher, S&P500 6 points higher. This shows that market still maintains its amazing stubbornly bullish stance. Having said that, the stakes for tonight's Non farm payroll has never been higher. The economic reports' stellar performance in the first quarter may be dented by a less than expectations results, proving that the recent economical reports may be due to a temporary QE3 boost and a seasonally good first quarter performance. Second quarter may be tougher than the first. Seasonally there is always a truth to the "Sell in May and Go Away" concept as enterprises cut down on production going into the summer holidays. Normally, the effect of the good earnings reports that were released in the 4th quarter in January gradually diminished going into the 2nd quarter. US companies' earnings results will start to be released on Monday, 8th April starting with the first DOW company Alcoa. All eyes are fixed on Friday's non-farm payroll. If non-farm turns out well, this bull run may have a chance of continuation. If not, we might start to see a few bears coming out of their hideouts. For local singapore stocks, K-Green, Singpost, Starhub and M1 are some defensive stocks to notice??? At least they did not drop much. Not a good session that DOW finally shows its triple digit drop after so many days. Today ADP employment report shows what it is like to fall short of the employment report. Coupled with SF FED president saying that Bond purchase might slow down has put a sudden brake to this bullish run. It just makes Friday's Non farm payroll stake one notch higher. With ISM falling less than expectations, all eyes will be on the non farm payroll. 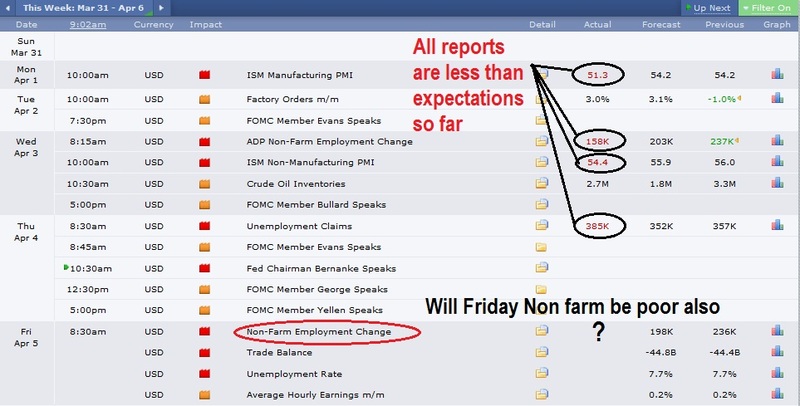 As expectations is high that jobs reports will be good, be prepared for another backlash IF non farm falls below expectations. My advise is not to enter position now till Friday. Only if the jobs reports report better performance, or else avoid the stock market temporarily.